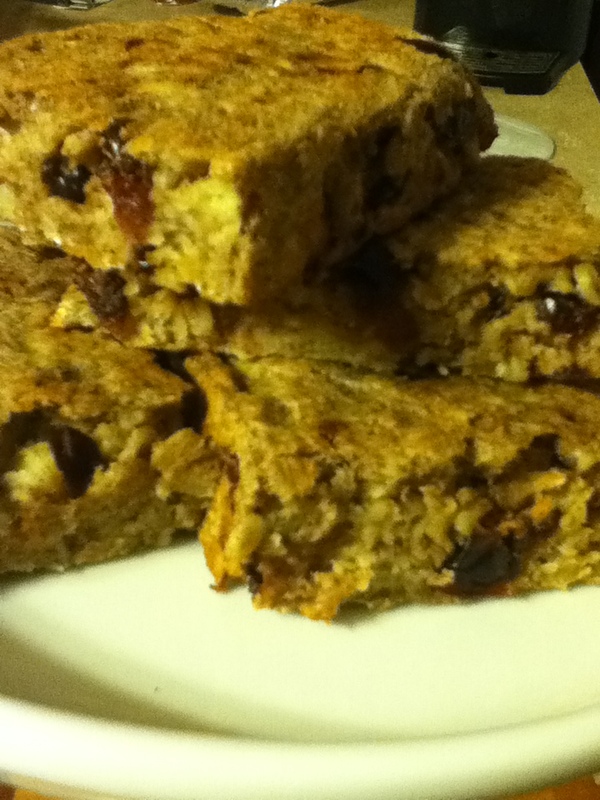 I’ve been on a quest to find a healthy, oatmeal bar to replace my addition to the sugar laden Quaker Oatmeal To-Go bars. I used this recipe as a jumping point (found at kateats.com) and made two variations which I have posted below the original recipe. I also plan on trying them with PB2, which is powdered peanut butter. This variation would call for 1/2 cup of PB and I’m thinking about adding raisins or some semi-sweet mini chocolate chips as a treat. **You can double the recipe and use a 9×13 baking dish. While delicious, the only sweetness in these comes from the dried fruit. Add in 1/4 – 1/2 cup brown sugar if you like. Following cooking directions above, however I removed the bars from the pan, flipped them, placed the large square onto foil and baked for an additional 10-minutes to dry out the bottom side. Makes 9 servings . Each bar is appx. 80 calories. These came out a little flatter than the banana ones and would make a great snack. * If you make a variation of these or if you already make your own homemade oatmeal bars, I would love to hear about your recipe!